Wave Wireless Switch-Adapted Trackball Mouse. Designed for users with limited hand control, motor skill difficulty, handeye coordination challenges and/or involuntary muscle spasms. 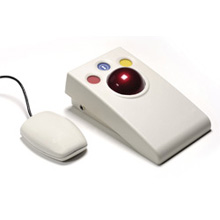 Features an oversized trackball with silky smooth movement that requires only the slightest touch. Color-coded buttons allow for left/right clicks and drag lock. Features two switch jacks for alternative access.